High moisture content in organic wastes leads to a leachate production. Vegetable waste is one kind of municipal solid organic wastes holding very high moisture (88–94%) and thus becoming nuisance to the environment. Composting is a viable technology to treat such organic waste. This research mainly deals with the insight on physic state of composting during composting of vegetable wastes added with the inoculum and bulking agents. This study showed the attainment of thermophilic stage (65–70 °C) during the composting process and completed with the pathogen-free end product. The bulk density increased from 312 to 380 kg m− 3 and was well within the recommended range (less than 1000 kg m− 3). The electrical conductivity of the end product was also within the mentioned range (< 4 dS m− 1). On evaluating the Pearson’s correlation coefficient matrix amongst physical parameters, the moisture content and the free air space exhibited positive relationship. Composting is the degradation of organic wastes in the presence of oxygen. It is one of the best biological treatment that converts waste into a useful compound known as compost. It is an eco-friendly, inexpensive and viable process for organic waste management. It naturally improves the handling characteristics of organic wastes by reducing its volume and weight . Composting process is regulated by the fundamental environmental factors such as temperature, moisture content, pH and aeration and some characteristics (such as C/N ratio, particle size and nutrients) of organic wastes . Organic wastes such as vegetable wastes possess higher moisture content (88–94%) and slightly acidic pH (5.1) as characterized in this study. Around 50 Mt. of waste is being produced due to the disposal of vegetables and fruits that causes the major environmental pollution at municipal dumpsites . Previous study reported that vegetable wastes decomposes naturally and produces organic acids  and leachate that may cause detrimental effects on water bodies. Moreover, disposal in municipal dumpsites may cause the contamination of soil. The composting process is a proven, safe and economical way to manage these organic wastes. Previous studies also found the composting of vegetable wastes and its application in the soil [5, 6, 7]. Varma and Kalamdhad  observed that the moisture content and leachate production have the adverse effects on the properties of the compost with the significant loss of micro-nutrients and heavy metals during composting of vegetable waste. Feasible composting condition may avoid the leachate production, thus achieving the success of compositing process. An application of immature compost may inhibit the seed germination and arrests a growth of plant . The efficiency of the process and the degradation rate of the organic wastes is enhanced by providing the adequate aeration in the composting mixtures . Bulking agents are known to be the best materials to achieve the feasible composting conditions by distributing an optimum aeration required for the complete process. The primary function of the bulking agents is to absorb an excess moisture content during the composting process, in addition to maintaining the carbon: nitrogen ratio in a feedstock. It not only enhances the microbial activity but also adjusts the porosity of a raw material and thus improves the overall aeration . Several researches have been carried out on the effect of bulking agents during the composting of various types of sludges (sewage and industrial sludge) using distinct composting methods [10, 11]. An experimental study was also performed to evaluate the effect of bulking agents during the composting of municipal wastes and animal manure . Earlier researches have demonstrated the effect of bulking agents on biological/chemical properties and gaseous emissions. However, rarely the literature is lacking on the physical state of composting or variation in the physical parameters such as bulk density (BD), porosity, free air space (FAS) during a rotary drum composting of vegetable wastes added with inoculum and bulking agents. The higher moisture content in the vegetable wastes can have an adverse impact on the rate of microbial growth during the composting process. There is a need to provide a better insight on the variation in physical properties during the decomposition of a vegetable waste added with the inoculum (cow dung) and bulking agents (sawdust and dry leaves). The parameter variation in the temperature, moisture content reduction, and other physical parameters (that controls the entire composting process such as BD, porosity, FAS, and particle density) along with the variation in thermal properties (such as a specific heat capacity) needs to be monitored and evaluated during the composting process. The physical parameters provide a better insight on the availability of water and oxygen that are vital for the survival of micro-organisms during the composting process. The higher amount of moisture content causes leachate production thus reduces the porosity and oxygen during composting. The favorable moisture content required for the biological decomposition lies between 50 and 70% . According to Haug , FAS should be more than 30% in the end product. The sufficient air flow can be supplied by the bulking agents to improve the structural and functional properties during the composting process. Bulking agents change the biodegradation kinetics and the overall performance of composting process . Mohee and Mudhoo  reported the strong relationship amongst physical parameters that may cause a significant change in the quality of an end product of composting. No such studies carried out during composting of vegetable wastes mixed with the inoculum and bulking agents in high capacity (550 L) rotary drum composter. The novelty of this research work is to study the physical state of composting or variation in physical parameters during rotary drum composting of vegetable waste mixed with inoculum and bulking agents. 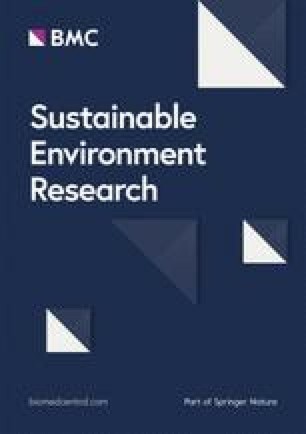 Hence, this study aims to determine: (1) how the combined addition of bulking agents and inoculum affects composting during the composting of vegetable wastes; (2) how these additions improvise the chemical and nutritional quality of the final compost; and (3) what are the correlations among various physical parameters. Experiments were carried out at Indian Institute of Technology Guwahati, Guwahati, Assam, India. 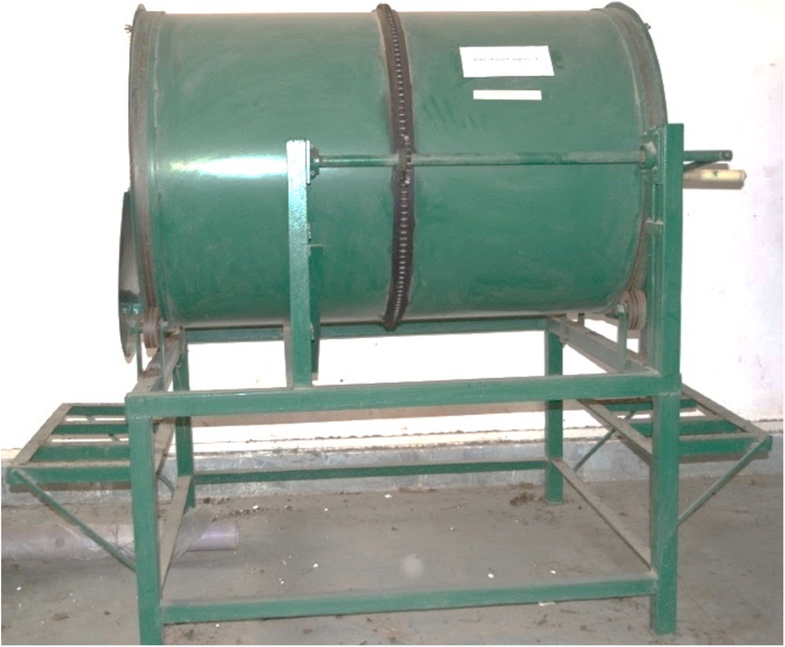 The composting study was conducted in 550 L rotary drum composter that was operated in a batch mode. It is an in-vessel technology, horizontally aligned, cylindrical in shape, and partially opened on both sides to maintain aerobic conditions. Rotary drum composter was mounted on four rubber rollers attached to a metal stand and was rotated manually with lever provided at one end. The inner portion of the drum was welded longitudinally using 40 × 40 mm angles, to confirm the suitability of agitation and mixing of wastes through the rotation. The vegetable waste was collected from IITG boys hostel (26°11′26″ N; 91°41′32″ E) Guwahati, Assam, India. Fresh cow dung and sawdust were collected from a nearby dairy farm and sawmill, respectively, located in Amingaon, Guwahati, Assam, India. An inoculum (cow dung) was added to achieve the faster degradation whereas sawdust was mixed with an inoculum to avoid the formation of lumps. Prior to composting, the larger size vegetable wastes were shredded to the size of 1–2 cm, to achieve a better aeration and moisture control. The materials were shredded by means of mechanical shredder equipped with 3.5 kW motor. The compost mixture was prepared by mixing vegetable waste (60 kg), cow dung (30 kg) and sawdust (10 kg) with the ratio of 6:3:1 as optimized by Varma et al. thus constitutes 100 kg as total weight. The amount of 10% (w/w) dry leaves, selected to be the locally available bulking agents, by total weight was added to the mixture of 100 kg. After, the feedstock’s were fed to a rotary drum composter, the composting was carried out for 20 d. The study was conducted at an indoor ambient temperature. The drum was rotated once daily manually to aerate and agitate the compost feedstock. The initial characteristics of physical properties of the various experimental materials are shown in Table 1. Figure 1 shows a pictorial representation of a rotary drum composter used for this particular study. The samples were collected (300 g per samples) from the center and two extremities (top, middle, and bottom) from each reactor. Three samples were collected on day 0, 2, 4, 6, 10, 14, 18 and 20. Then each sample was divided into two parts. One part was oven-dried, ground to pass through a 212 μm soil sieve and stored in a vacuumed desiccator. The oven-dried samples were used for the determination of physical properties, pH, electrical conductivity (EC), particle density, and the contents of volatile solids (VS), total organic carbon (TOC), total Kjeldahl nitrogen (TKN), total phosphorus (P), and total potassium (K). While the other part, which is not oven-dried, was used to quantify the BD, moisture content, and porosity. Temperatures in the top, middle, and bottom layers of the composting mixtures in the rotary drum composters were monitored using a digital thermometer with a temperature sensor attached to it. Temperature data was collected daily after every 4-h during the entire composting process, and three reading were averaged per composting mix. Ambient temperature was also recorded using the same temperature sensor. The moisture content was determined gravimetrically by drying samples at 105 °C using hot air oven for 24 h. The 2 L volume mild steel container was used to measure BD. The measurement of BD was carried out in three stages. In first stage the container was filled up to 1/3rd height and tapped on a plain surface so as to ensure the filling of voids, and in second stage the container is filled up to 2/3rd followed by tapping on a plain surface and in last stage it is filled up to the top brim of the container. BD was calculated as a ratio of the mass of waste (Ms) per volume of waste in the container (Vc). where ℊ = specific gravity; γw = BD of water; ωwet = wet moisture content; γwet = BD of compost. The FAS was calculated from the BD and PD of the compost matrix using following Eq. (3). VS content (weight loss on ignition at 550 °C) was determined using muffle furnace. TOC was calculated using Eq. (4) as follows . The specific heat capacity (Cp) was determined using empirical formula given in study by Keener et al. using Eq. (5). where, ASH is the mineral content (%) and MCd.b is the moisture content (%) in dry weight basis. pH and EC values were measured for waste: distilled water extract ratio of 1:10 (w/v) as per described methods [3, 19, 20]. TKN was determined by using the Kjeldahl distillation method. Stannous chloride method (acid digestion) was used to find the available and TP . Potassium (K) was determined with a flame photometer by digesting 0.2 g air-dried 212 μm sieved sample with 10 mL H2SO4 and HClO4 (5:1) at 300 °C for 2 h .
As noted earlier, the samples gathered from individual composting reactors were treated as triplicates for each sampling time and their mean with standard deviation is reported in this paper, which is calculated using Microsoft Excel, 2010. Parsons’s correlation coefficient was calculated using SPSS 20.0 among various physical parameters. Temperature is one of the key factors that indicates microbial activity during the composting process. It affects the rate of reactions, and aid in killing harmful pathogens, and plant seeds during the composting process, thus maintaining sanitation capacity of the process . It is predictable that composting process is a four-phase process, consisting of the first as mesophilic phase (25–40 °C), second as thermophilic phase (45–70 °C), then cooling phase (second mesophilic phase), and maturation phase . However, as shown in Fig. 2a, the temperature reached the thermophilic range (45–70 °C) immediately within 24 h of feeding the rotary drum composter. The optimum temperature range for composting is 40–65 °C . The maximum temperatures that have been recorded during the current study was 68.9 °C (on day 2). The study on composting of food wastes mixed with various bulking agents (wheat straw, hay and wood shavings) showed the maximum temperature of 50 °C (on day 3) . 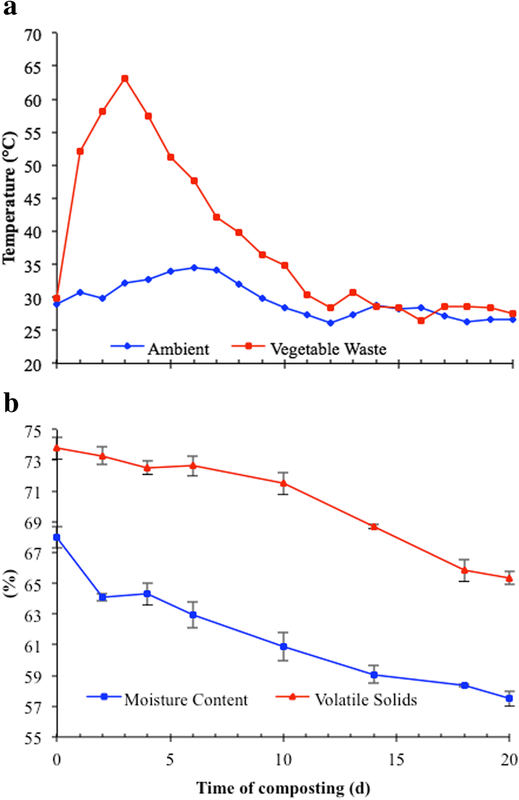 According to Jolanun and Towprayoon , the composting of vegetable wastes mixed with rabbit food and granular materials exhibited thermophilic phase within 6 h after feeding. In the present study, a thermophilic phase lasts for 6 d during the composting process. As anticipated, the initial thermophilic temperatures are owing to the addition of dry leaves that delivered appropriate aeration for biological activity. After 6 d the temperature started declining and it continued falling until the 20th day and was recorded as 27.6 °C, i.e., nearer to ambient temperature. The downward gradient of temperature indicates the slower microbial activity and a lower rate of degradation. The temperature 55–60 °C for more than 3 d is essential during the composting process to obtain a pathogen free compost . The addition of the dry leaves (10 kg) substantially increased the period of the thermophilic phase that lasts for more than 5 d during composting process. Similar types of results were obtained during the composting of vegetable wastes . According to Khalil et al. , the conventional composting process requires 90–270 d to produce stable compost. However, in this study the biological activity was observed stable after 18 d, which is indicated by stability in VS reduction on day 20. The composting process is greatly affected by environment factors (temperature, moisture content, pH, and aeration) . Moisture content is an essential parameter that influences the changes in physical, chemical, and biological properties of waste materials during the advancement of decomposition of organic matter. Huerta-Pujol et al. reported the moisture content of the mix significantly influences biological activity. In the present study, vegetable wastes were having higher initial moisture content (89%). Hence, the addition of bulking agents was considered to absorb the excess moisture during composting process. Due to the addition of bulking agents, the initial moisture content of the original mix decreased as tabulated in Table 2. Figure 2b illustrates the decreasing trend for moisture content. Due to the availability of readily biodegradable organic matter, first peak in the temperature (> 65 °C) were recorded within 3 d, and no leachate was witnessed during the composting process. As a result of decomposition during composting, moisture content and vapors produces, which were absorbed by bulking agents and trapped in the rotary drum composter . The moisture content of end compost after 20 d was recorded as 57%. Total 15% reduction in moisture content was observed due to addition of bulking agents and due to the loss of water through evaporation. Thus bulking agents played a major role in absorbing moisture content and leachate production during the composting process. Previously reported studies showed that the bulking agents acts differently for the reduction of the organic matter during the composting of various wastes which depends on the type and quality of the bulking agent used during the composting process. The addition of recalcitrant organic materials reduces the degradation of the organic matter and enhances the humification and the quality of the final composts . In the present study, the TOC and VS decreased significantly during composting with the maximum reduction occurring during thermophilic phase (> 45 °C). The 13% decrease from the initial TOC value was observed during entire composting process as tabulated in Table 3. An initial VS was 74% and reduced to 65% after 20 d of composting (Fig. 2b). It was noted that added dry leaves have significantly contributed more organics and VS. Hence, such bulking agents should be reused as Varma et al. stated that the removal of bulking agents from compost could provide a better reduction in organics and VS.
BD is the critical parameter that optimizes composting process, as it determines the optimal conditions for the microbial development, microbial activity, and organic matter degradation . The bulk density is also responsible for the change in various mechanical properties such as strength and porosity . Moreover, bulking agents aid in absorbing excess moisture content from the substrate. Zhang and Sun  reported that the bulking agents play a significant role in optimizing BD. They further observed a lesser BD in final compost in the mix with bulking agents compared to that without bulking agents . In the present study, during the composting process, wet BD was observed to be increasing from 312 to 380 kg m− 3 and volume reduction was observed to be prominent. It was clear during the thermophilic phase that BD showed greater increase when compared to the entire duration of process, which was owing to loss of organic matter. Other studies carried out on various organic wastes also showed a similar pattern for BD . The 22% increment from the initial BD value was observed during composting process of 20 d as illustrated in Fig. 3a. The particle size of composting materials also plays an important role in increasing the BD. The study performed on municipal solid waste composts in different particle size fractions indicated increasing BD with the decrease in particle size of wastes . The study conducted by Jain et al. on composting nitrogen-rich organic waste with biochar as bulking agent also showed increasing trend for the BD during composting process. Excessive moisture present in the organic wastes causes leachate formation and reduction in the porosity and FAS. Physical parameters such as porosity and FAS are evaluated for optimizing the composting process. FAS should be present more than 30% for proper aeration during composting process . Bulking agents are carbonaceous material that provides optimal FAS. Moreover, it regulates the moisture content during the composting process. An interesting observation was that despite of 22% increment in BD, the variation in the porosity was not significant during the entire composting process as shown in the Fig. 3a and Table 2. Bulking agents also increased the pore space . Furthermore, volume reduction after composting revealed that enough pore space was available for microbial activity to degrade the organic matter during the composting process. FAS is an essential parameter as it measures the magnitude and movement of air through composting mix. Jain et al. reported that ratio of waste to bulking agent could influence the percentage of FAS in batch composting. In the present study the initial FAS was 73% and reduced to 67% after 20-d of the composting process (Fig. 3). The initial FAS of 80–90% showed no adverse effects on the composting process . It also depends on the particle size of the wastes. Therefore, less reduction was observed during the composting process. FAS values for different substrates reported in the literature are tabulated in Table 4. All the studies including present study exhibited the recommended values of FAS (> 30%) except for Gabriels et al. that indicated excessive composting aeration during the process. PD, the average density of all the minerals that available in the compost, is frequently used to calculate the FAS of organic wastes . It also depends on nature and type of substrate used for composting. PD varied from 578 to 687 kg m− 3 during composting process in the present study. Other studies also reported such small variation during composting process as tabulated in Table 5. However, Mohee and Mudhoo  and van Ginkel et al. revealed considerable variation in the PD durng composting process over the period of time. According to van Ginkel et al. , PD depends on the change in ash content and VS during the composting process. The thermal properties such as heat storage capacity, or specific heat, of the bulk material usually influences the amount of material required to maintain the appropriate rise in temperatures . The specific heat capacity is also the function of moisture content. As anticipated, the increase in the ash content was observed with the decrease in the VS contents (Table 3). An increase in ash content directly influences the increase in specific heat capacity during the composting process. Moreover, Rahman  revealed a linear relationship between moisture content and thermal specific heat. For current the study, the 16% increment in specific heat capacity was observed during the thermophilic phase. pH is an important parameter in governing the decomposition process . Biological activities are mostly influenced by the change in pH, and a neutral pH is recommended to be optimal for the composting process . The pH showed an increasing pattern during the composting process as illustrated in Fig. 3b. During the initial rise of temperatures, the pH increased quickly from 6.8 to 7.1 in the thermophilic phase. Subsequently, increase in the pH was noted during 20-d composting process. The pH for end compost was recorded as 7.6. Others revealed that the range of pH between 7 and 8 supports the microbial activity for the decomposition of organic matter during composting process . In the present study, the pH was close to the desired optimal range for composting process and in the later stage, pHs were relatively constant as the composting process ended indicating the stabilization of process and lower microbial activities. Increase in the pH during the composting process occurs mainly due to activity of proteolytic bacteria and higher buffering capacity of bulking agents avoids further pH fluctuation . The mineral cation concentration increases with the decomposition of organic materials and is not reduced by binding to stable organic complex . The changes in EC showed a typical trend during the composting process as shown in Fig. 3b. During initial rise of temperatures, the EC increased quickly, or from the initial 2.1 increased to 3.5 dS m− 1 during composting. Zhang and Sun  reported that addition of bulking agents usually increases the EC values during the composting process as it increases the production of inorganic compounds and the release of ions. The EC value less than 4 is recommended for the compost application in soil. The bulking agents could enhance organic matter decomposition and hence increase the rate at which ions are released. It may be the reason for an increase in EC during composting added with inoculum and bulking agents. Nutritional properties such as nitrogen, phosphorus, and potassium were measured during 20-d composting process. It was observed that all nutritional parameters were observed to be increasing during the composting process. The TK concentration was observed to be increased from 14.3 to 25.2 g kg− 1 during the composting process as illustrated in Fig. 3c. The addition of bulking agents absorbed relatively large amount of moisture and intact structural integrity and porosity could be responsible for preventing the loss of potassium during the composting process. Phosphorus concentration was also found gradually increasing from 3.4 to 4.4 g kg− 1 during the composting process (Table 2). In the present study, TKN also followed an increasing trend; from the initial value of 1.5 to 2.2% - an increase by 1.5-fold during the composting process (Fig. 3c). An increase was due to the addition of bulking agents that absorbed the higher amount of both aqueous NH4-N and gaseous NH3 during composting process . Table 6 shows the Pearson’s correlation coefficient matrix, representing the relationship among the various physical parameters such as moisture content, FAS, BD and PD as they play the significant functions in attaining a better composting process. A negative correlation coefficient between moisture and BD was observed to be − 0.98; as the moisture decreases, the BD increases. Also FAS was negatively correlated with BD, but positively correlated with the moisture contents of the sample. Thus, a decrease in moisture content decreases the FAS between compost mix. The results of the current study signified the scope of additives aided composting process. The moisture content was observed to be 57% at the end of the composting process, and was within the recommended range. The maximum temperature rise was observed up to 68.9 °C during composting process. BD followed the increasing trend during the composting process. The physical parameters such as moisture content, BD, porosity and FAS found to be in the relationship with each other. FAS and moisture content exhibited a positive correlation with an extremely high correlation coefficient (r = 0.98).